I love zucchini. Easy to grow and delicious -- what more could you want? And I thought I had found the perfect variety: For the past several years I've grown Costata Romanesco (as seen in this picture from Johnny's Selected Seeds) – the rich, nutty flavor and crisp texture put it in a class by itself. It is also beautiful, AND isn't so extreme when it comes to yield. 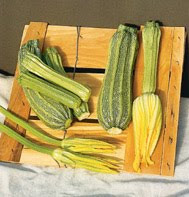 Normal zucchini produce in gross excess. Costata Romanesco produces maybe half as much -- a far more manageable amount. But: there is a problem with all the zucchini I've ever tried. Right when they are hitting their stride and producing away, a devilish little insect called the squash vine borer suddenly causes them to wilt, collapse, and die. These noxious little beasts don't eat the leaves like most insect pests – no, the larva burrow through and eat the stem, right at the base of the plant. In other words: They munch away at the one place where a little damage can kill the entire plant, bringing the zucchini harvest to a screeching halt. I've not seen any scientific studies on this, but personally I'm convinced the borers do this out of a twisted desire to ruin my summer. You can bet that if zucchini was a weed, they wouldn't be so eager to eat it. Rotten borers. stretched out butternut intended to be eaten young, as a summer squash (though you can apparently eat at the end of the season as a winter squash too). Could this be it? A borer resistant zucchini? Well, we shall see.The reviews on Dave's Garden are overwhelmingly positive, though one person mentions a problem with borers! NO!!! I'm going to be growing it along with Costata Romanesco this year, comparing how they do with borers, and and putting them head-to-head in a taste test. 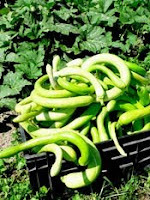 Hopefully, the crazy new squash with the too long name will become my new favorite and I can kiss squash vine borers goodbye! Very interesting. I haven't had any troubles but this is good to know in case I do. Borer problems seem to be very location specific: I've gardened in four different locations, two of which (including my current one) had terrible borers every year, while in the other two they were never a problem. Not sure what the difference is... but if you don't have them, consider yourself lucky! This is very good information. I love zucchini too but like you have problems with the borers. Urgh! I wrote down this stretched variety so I can look for it. I think it is well worth giving it a try. Glad you are enjoying the blog, Tina. I got my seed from Pinetree, if you want to give it a try. Hope you enjoyed your Tromboncino! We love that squash but it sure does grow LARGE.